Do you ever talk to your self? Have you ever heard yourself say something like: A part of me really feels uncomfortable when I'm around certain people. Another part of me doesn't want to say anything in case I upset them. And yet another part of me thinks I'm stupid for letting them get to me at all! In the late 1970's, ground-breaking therapists, Drs. 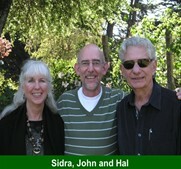 Hal & Sidra Stone, developed a highly transformational approach to personal development called Voice Dialogue. This safe and simple process enables you to tune in to your different selves and allow their voices to be heard more clearly and distinctly.